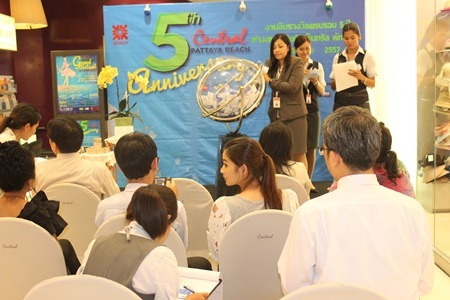 Central Festival Pattaya Beach thanked customers for five years of support by giving away more than 100,000 baht in prizes. 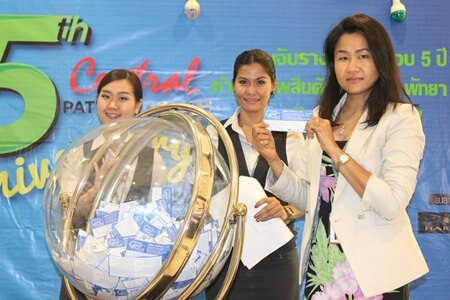 Mall managers Suchada Petchsri and Benjawan Petchpan hosted the Aug. 20 giveaway open to customers that spent more than 2,000 baht during Central’s late-August promotional week. The grand prizes were three AirAsia tickets worth a total 60,000 baht. Other prizes included a hotel voucher for the Centara Grand Mirage Beach Resort, spa tickets, SFX Cinema tickets and more. In all, 45 prizes worth more than 100,000 baht were given away. Soratorn Waenpradap. Pornsiri Senkan and Akaradit Sritongkam won the plane tickets and Somjit Taylor took home the hotel voucher. 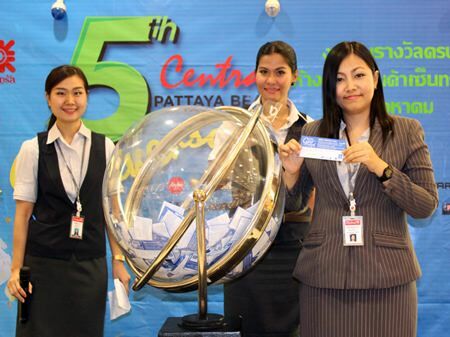 Suchada Petchsri, office manager of the Central Festival Pattaya Beach and co-host of the event, pulls out a lucky draw ticket. Benjawan Petchpan, products manager of the Central Festival Pattaya and co-host of the event, announces another lucky winner. Previous articleIs it time to go back to square 1?